This one is related to Report Designer tool as a part of BEx Suite or BI Suite. 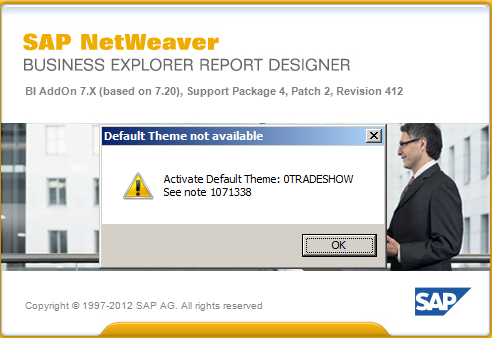 The Report Designer tol as itself was introduced within SAP BW 70 version. This was before acquisition of BusinessObjects happened. Just because of this acquisition while SAP got a bunch of other reporting tool this tool was soon to be faded out. Therefore there will not be any devilment of the tool most likely. However the tool remains as a part of SAP GUI delivery along with other major BEx parts: Query Designer, Query Analyzer and Web Application Designer. The purpose of the tool is formatted reports report (static or dynamic). Web reporting is supported as well. Report’s output can be PDF document or to be printed out. As data source BE’x queries and query views are supported. For comprehensive online documentation of the tool see here. Error is very well documented within the note. Issue is caused that in your SAP BW backend system the default theme (0TRADESHOW) is not activated. All you need to do is to go in TA RSOR (BW Metadata Repository) and activate it as per note.